Two weeks have passed since my last entry. As you may have known (if you read said post) I had been on holiday, and therefore work on my dream build play project hadn't happened for a long time. Last week I returned, and therefore a week of progress should have occurred. Unfortunately this wasn't the case as I got back into playing games every day which resulted in me buying a PS3, playing Uncharted and finally completing Mass Effect 3; the ending to which wasn't as bad as the internet had made out, but still wasn't brilliant. However at the end of the week I did make some progress on the game. I started looking at the environment that the player will be spending the majority of their time in. This led to me to start designing it and I ended up building the core structures. 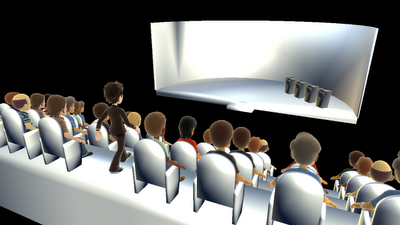 As you may have realised with both this image and images shown in previous posts, my game will have a game show style. This is because my game is a trivia based game, with a selection of rounds designed and ready to be implemented. The image you see above is audience that will be watching the player(s) play the game show who will hopefully applaud and cheer during the game. The image does showcase however the limitation I have when design things around the Xbox avatars as all have to be designed around a limited animation pack that is provided by the AppHub. For those that don't know why, this is because custom animations can only be created in expensive bits of software (see Maya and 3DS Max). The player you see at the top of the stairs is the host of the game and will introduce the show and provide quips throughout it. As this guy will probably be voiced by me, there will be a feature to turn him off. The reason for the host being at the top of the stairs is because he will walk down and onto the stage (pictured above) before he introduces the show. I'm really wanting to capture every moment of a game show you would see on television and this goes down to the little details. So that's the progress I've made so far. 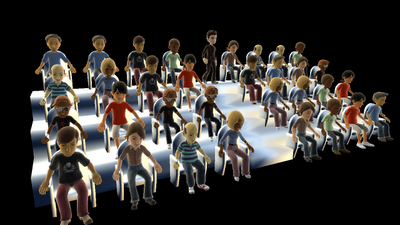 The next stage is to get the host to actually reach the stage and to get avatar voice work implemented. Only seven weeks to go, so I better get a move on.